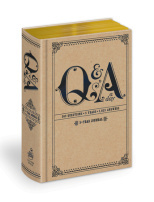 Q&A a Day is a 5 year journal that supplies prompts to simplify the process of documenting one’s life and memories. Many moms and most bloggers know the feeling of sitting down to write your thoughts and memories of the day and drawing a blank. Whether secondary to exhaustion or writer’s block, not being able to utilize your precious few moments with pen in hand to jot down your thoughts can be extremely frustrating. What are you chasing at this moment? Where do you go for good ideas? What new activity have you tried? The prompts are useful as quick journal entry questions, but many could also be used for blog post inspiration. I’ve been using the Mom’s One Line A Day 5 year Memory Book, which just provides 5 lines per day for 5 years, but no prompts. I typically record things that have happened in the kid’s lives, but very little about myself. The questions in the Q&A a day help ensure that I enter something unique to my personal life and they are also especially helpful on days when nothing too exciting happens. The questions really make me think and record thoughts on topics that I might like to reflect on later in life or that my kids might enjoy reading that I may otherwise have forgone writing. There is also a version specifically for kids, ages 4-10 that lasts for 3 years! Do you have a journal or memory book you have had success using?